R made a circle chick, inspired by Katies Nesting Spot. R freely painted on a sheet of paper with yellow paint and a nail brush. When the paint was dry, I used my scrapbooking cutters to cut out 2 circles. I also cut out some legs and R painted on them with brown paint. After looking at some pictures of birds and discussing the body form of a bird, R glued the bird together with some verbal assistance. Using an empty toilet roll, R made a circle painting. R chose green and yellow paint, and I squeezed them onto the paint tray together, but didn't mix them. It made a cool colour combination. He dipped the end of the toilet roll into the paint and then pressed it onto the paper. R made a cupcake from painting and collage. This idea was inspired by Totally Tots.﻿ I drew a cupcake base and top. R painted with a small brush on the base. On the top, he collaged some sprinkles. I made the sprinkles by cutting up some mosaic squares into thin strips. R and I played Connect-4. R enjoyed filling the grid and then making the counters all fall out the bottom. He also stacked the counters. I made a mini sensory box from rice. 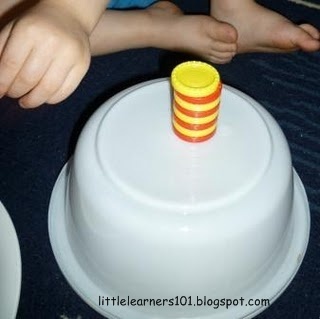 I hid coins in the rice and R had to find them and put them into the rubber muffin cup. He loved this and spent so long playing with it. I was glad I put the activity into the black tub, because it did not take long for the rice to be poured into the tub. R then filled the muffin cup with rice, poured it into the plastic container and then dumped it out again. I can't remember where I saw an idea similar to this, so let me know if it's yours, so I can add in a link! We did some cutting with scissors. R has now progressed to opening and closing the scissors on his own. When we first began cutting, R needed help to open the scissors, but now he can do it on his own! Next step is to get him holding the paper as well as operating the scissors. R loves playdough and this week was no exception. He can roll snakes on his own now. We used the snakes to make a letter C using the Main Letter Page from Tot School Printables. From there, we made circles with the playdough snakes. I put some shaving cream on the table for some fingerpainting. I showed R how to draw C's on the shaving cream and here is his attempt. We used our circle magnets to make the C is for Caterpillar page from Confessions Of A Homeschooler and the Circle Page from Home Grown Hearts. We sorted all the circles from the Shape Sorting Station from Home Grown Hearts. I also made the Shape Tracing Cards and R traced the circle with his fingers. He is not quite able to trace with a pen yet, but we are practicing. 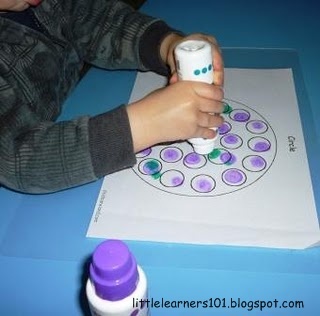 R used his Do-A-Dot Markers to stamp on a circle shape, found at Childcareland. I could not find the exact link, but it is somewhere on this wonderful website. I got out the buttons and got R to sort out the circle buttons from the rest. R needed lots of support with the activity. 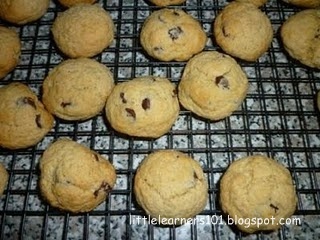 We made choc-chip cookies. R really enjoys cooking. We did some dancing with a hula-hoop. We also got out our musical instruments box and played the drum and tambourine. I gathered all the balls in the house and we explored them. We discussed the textures of them and sorted them by colour. Both of us tried juggling balls like a clown, but it was an epic fail. We settled for rolling and throwing the balls to each other! We did some simple size sequencing with the cat cards from Tot School Printables. 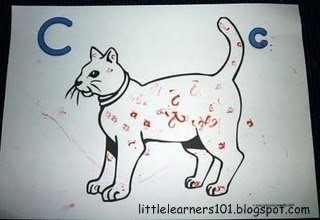 R did some "Cc" stamping on the cat from Tot School Printables. We did some Cc tracing with the tracing page from ﻿Confessions Of A Homeschooler. R traced the letters with his finger. I think I will give him a pen to use next time. R made a "Cc" Caterpillar. He did Do-A-Dot Painting on a sheet of paper, and then I cut it into circles using my scrapbooking tools. I then drew a large 'C' on the paper and R stuck the circles onto the 'C'. He used a glue stick, and is still learning how much glue to put on and which side to put the glue onto. Lastly he glued on the eye. This was inspired by First School. I had some celery which had past it use-by date, so I mixed up some food colouring in a paint cup and﻿ sat the celery in it. We checked on it over the week, and watched as the celery turned red. I forgot to get a photo of the celery at the end of the week. Next Program: Letter Dd and Yellow. Great week!! I think the cupcake painting was my favorite. Too cute!! Such cute ideas! Love the celery project and the cupcake! The cupcake is my favourite too. I was thrilled with how it turned out. R calls the sprinkles "spinkles". R was showing Granny his Craft Scrapbook and told her "collage spinkles". So cute!